†Now at Mohawk Valley Community College, Utica, N.Y. 13501. We have measured the surface current densities on the shadow sides of diffracting disks for normally incident microwaves and compared our results with Andrejewski’s calculations from exact electromagnetic theory. We employed diameters of disks ranging from 3 to 30 cm and wavelengths ranging from 2.5 to 30 cm. 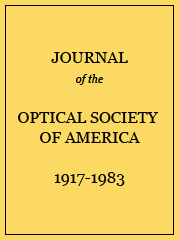 The most-reliable measurements were made for ratios of diameter to wavelength in the range of 0.3 to 3.0. The checks between experiment and theory give us added confidence that we can measure the tangential magnetic fields and associated surface-current densities over any conducting surface.